Topics: Leadership, Leaders, Senior Pastor, Trustees, Management Team, and Departments. 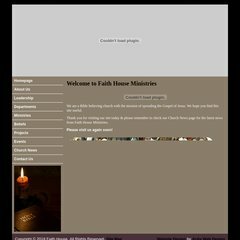 faithhouse.org.uk Senior Pastor - Faith House Ministries - Hornchurch - Dagenham ..
faithhouse.org.uk Leadership - Faith House Ministries - Hornchurch - Dagenham ..
faithhouse.org.uk Beliefs - Faith House Ministries - Hornchurch - Dagenham - Barking ..
faithhouse.org.uk About Us - Faith House Ministries - Hornchurch - Dagenham .. It has 3 DNS records, ns2.phase8.net, ns0.phase8.net, and ns1.phase8.net. It is hosted by Namesco Hosting Thn (England, Worcester,) using Apache web server. The programming language environment is PleskLin. PING www. (85.233.168.99) 56(84) bytes of data.